VFL: "The best win of the season"
Tom Langdon gets showered in Gatorade after his first match for the VFL Magpies ended in a 14-point win over Geelong at Simonds Stadium. Photo: Shane Barrie. A tremendous eight-goal final quarter inspired Collingwood to a 14-point win over Geelong in the penultimate round of the VFL at Simonds Stadium on Saturday. 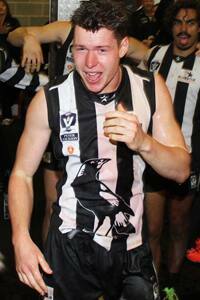 The win ensures the Magpies will feature in the VFL finals for the second year in a row. Development Manager Craig McRae described the victory as his side’s best this season. “I think that was our best win for the year at this level, I really do,” McRae told collingwoodfc.com.au. “Just the character...to be 16 points down, something had to change and a lot of players stood up with a lot of really good efforts,” he said. “We pride ourselves on our contest and our pressure. To their credit they were winning that battle, but guys stood up. “Corey Gault, Kyle Martin, Jesse White, Tony Armstrong, they really stood out in that last quarter. Q Lynch really stood up. The win required a dramatic turnaround from what transpired in the third quarter. Although Collingwood held Geelong at arms length for most of the first half, much of its lead could be attributed to its ability to convert in front of goal and, conversely, their opponents’ inability to take their chances. The Cats kicked 3.12 in the first half but roared to life in the third term, kicking six goals to two to open up a 16-point advantage at the final change. With everything in Geelong’s favour, one Magpie stood up to turn the tide. The former Swan loves playing at Simonds Stadium, having kicked five goals at the venue in his first match for Collingwood in the NAB Challenge in February this year. White took the match by the scruff of the neck, kicking four goals and taking several towering pack marks as the Magpies streamed forward. Credit also has to go to several midfielders, most notably Callum Matheson who worked tirelessly around the packs all day, and Kyle Martin, who produced a big final quarter in the centre square. “White was superb, winning his one on ones when we got it to him,” McRae said. “There were so many. I really thought Corey Gault in the ruck took another step forward in his development today. The win locks in Collingwood’s fourth finals appearance from its seven years as a stand alone VFL team. The Magpies took on Port Melbourne in last year’s Elimination Final, and although they acquitted themselves well, they still fell short against their more experienced opponents. McRae knows both players and coaches alike are better prepared this time around. “There’s a good buzz around the group now,” he enthused. “Everyone knows how good that last quarter was and to have done what we did.